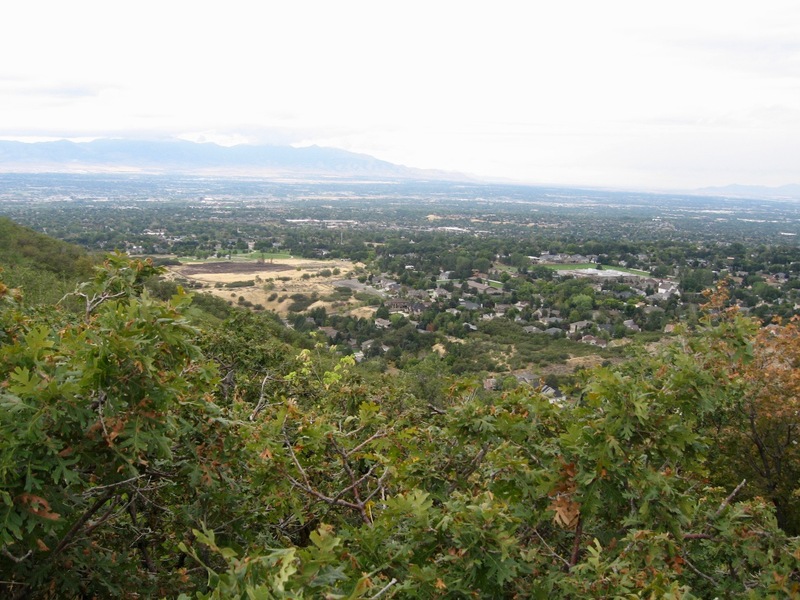 Dad grew up here, within walking distance of an amazing part of the Wasatch Mountains. He loves to hike and fish and shared that love as soon as we were big enough. We frequently trekked to Bell Canyon Reservoir. It was a good hike for the whole family. The trail was actually a drivable road, so it wasn't brutally steep and was less than a mile long. At a relatively low altitude, the reservoir is one of the first places we could hike while other destinations were still snowbound. For tougher hikers, another (steep, rocky) mile leads to a waterfall. Hard-core adventurers can eventually get to the top of Lone Peak. When I was nine, Dad and I went to the falls for the first time. It was a right of passage and the beginning of an adolescence filled with trails to lakes, summits, and waterfalls. I miss these hikes, but especially Bell's Canyon. My very biased opinion is that it is as pretty a place as can be found anywhere. In mid September, the water is low and leaves are just starting to change. For several years during my young adulthood, access to our canyon became a problem. Although the reservoir is on Forest Service land, the beginning of the trail was privately owned. It was sold and built on, so we couldn't get to the road any more. But there was a "secret" alternate trail that worked for a few years until people living near it started to object. They even had the police turning hikers away one Memorial Day. Eventually enough political fuss led to a solution. The city bought two pieces of land with enough room for parking lots and two new trailheads. Neither new trail is as easy as the original, but they are both very popular. The parking lots are jammed every weekend all summer. Even at night, as my husband and I walk in the park, we can see the flashlights of hikers moving up and down the trails. When we walk in the daytime, we look right up the canyon and express a wish to hike to the falls one more time. A three-mile round trip sounds like nothing, but my husband has a bad knee and I have a bad everything. The hike is short, but jarring. Steep and rocky, it's three miles of stair climbing, with none of the stairs at standard intervals. I am not stupid enough to attempt the falls, but that doesn't mean I'm not stupid. On Tuesday my boys were both home and I needed an adventure, so we hiked to the reservoir. Because it was a weekday and had just stopped raining, we were able to find a parking spot by the longer, but easier trail. The short trail follows a stream bed and is essentially a tall building worth of stairs with no level parts until the reservoir. The easier trail is more accessible, but not accessible enough that we didn't think it was very funny that there is a handicapped parking spot in the lot. 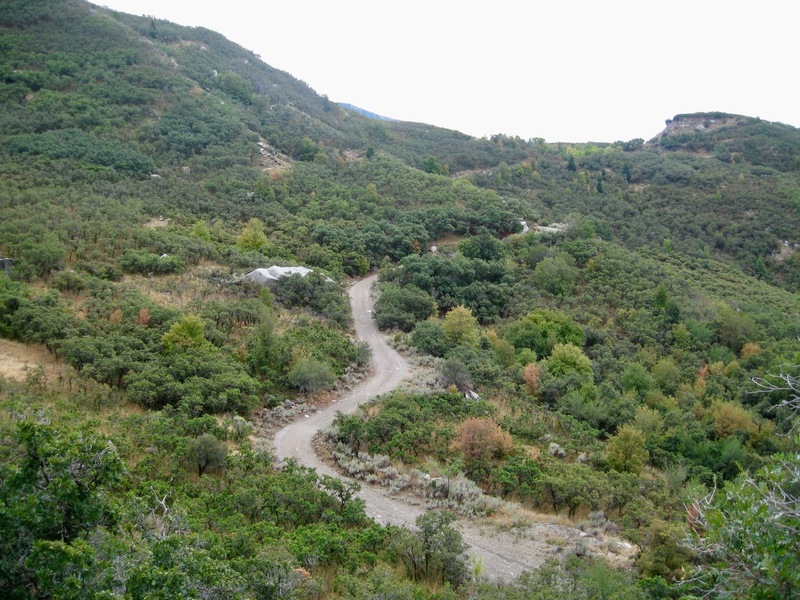 The trail is steep and rocky from the start, steepest and rockiest for the first hundred yards. It has easier moments, but for the most part it's a steep, rocky, half mile. Oldest doesn't know how to hike slowly. I saw him only occasionally. Youngest is my guardian angel. He stayed with me so the mountain lions and coyotes wouldn't pounce. There were a lot of people on the trail; I was probably perfectly safe, but appreciated the company. Aside from the wild natural beauty, both the reservoir and the falls have an added advantage of great valley views. 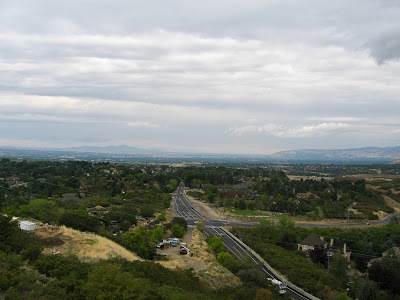 The rain gave us clean air, so we could see the entire Salt Lake Valley including not just downtown, but the lake. In the far distance were the silhouettes of Stansbury Island and Antelope Island. But when the whole world is in front of you what do you want to see? Home. I used to laugh at my students who would play with Google Earth not to explore the Himalayas, but to show each other their driveways. But it seems to be a human instinct. My boys and I stood by the reservoir and did what I have done countless times--followed the lines of familiar roads and landmarks to try and find a corner of our own roof. We couldn't see our roof because the trees are too tall. We couldn't even see the neighbor's yard I used as a landmark during my childhood. Thirty years is a lot of time for trees to grow. But we could triangulate ourselves between the recent grass fire in the park, the elementary school, and the cell phone tower. We identified enough neighborhood homes to have a pretty good idea which patch of trees hides our house. Oldest's cell phone informed us the hike was 1.4 miles and the equivalent of 17 flights of stairs. By the time we went to Dairy Queen and got home, it was a fun two hour trip. I've been paying the price ever since. Everything hurts. I'm in too much pain to sleep off the pain. Two days later, I'm writing this with a splitting sinus/exertion headache that the best drugs doctors are willing to give me won't touch. It's not all down to one hike. 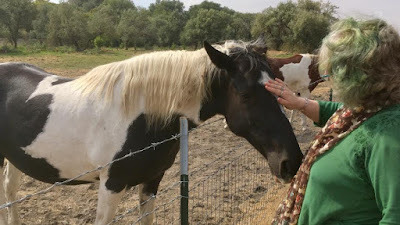 My husband and I explored a different walking path Saturday and walked too far (but met horses). I swam Monday. I even walked a bit the evening after the hike. We are both trying to lose weight and I am trying desperately to get strong enough to travel without really hurting myself. But so far I can't participate in regular moderate exercise without really hurting myself. Next week I will be writing without moderation. I have signed up to participate in an RA Blog week. The goal is to write each week day and there are suggested topics. If that's more of me than you want to read, I understand. I've almost finished the grey shawl. It just needs to finish drying and get photographed in a more scenic condition. It is currently wrong-side up and pinned to colorful foam boards, but when finished it should be an elegant accessory in recycled natural Shetland wool from Renaissance Yarns. My current project is to finish a shawl I started during the Shakespeare trip in June. It is made from a lovely blend of merino wool and American bison from Mountain Meadow Wool, but isn't quite big enough and doesn't hold a proper shawl shape quite yet. I have ordered some more of the natural wool color and will add a border that will (fingers crossed) fix both of those problems. I hope to show you both shawls in finished states next week. I am so happy you will be joining us again this year for RABlog week. I love the blog. It is so cool to remember how much I love the American West. Your pictures make me so nostalgic. Thank you so much. I'm looking forward to the challenge and opportunity. I have four blogs for next week outlined in my head. Now for the tricky part of typing them and making them sound right.